Every so often there is talk of the possibility of an alien invasion occurring here on earth. Actually, such a possibility does exist. However, I would suggest that the real alien invasion has already occurred. In fact, it happen a long time ago. The actual invasion took place on many different levels. However, the deepest incursions (and the greatest battles) were not fought in deserts, cities or jungles. Rather, they occurred on an entirely different kind of battlefield. And the "enemy", although alien in some ways, is not entirely unfamiliar to us. It has been said that there is no greater prison than the prison that we create for ourselves within our own minds. Are our minds free? Or have they become cluttered with so many external influences and distractions that it has clouded our ability to clearly think, reason and discern as individuals? If our reasoning skills have indeed become impaired, then the decisions that we make regarding what we choose to create, could also be impaired as well. Before anything new can be created, it must first begin as an idea. This brings up the obvious question, where do our ideas come from? Are they a product of our own minds? Are they inspired and influenced by outside forces? Or are they a combination of both? How many times have you heard a musician or an artist say that they got an "inspiration" from out of nowhere? How many famous songs have arrived to musicians via dreams or inspirations that came in the middle of the night? How many times have you heard an artist say that they can feel a creative "force" running through them when they create or perform? For many artists, these types of things are actually the norm, rather than the exception. The rocketry of Nazi Germany? The integrated circuit, the computer and the internet? How did tribes of the Amazon discover how to combine two very different plants together in just the right way in order to successfully produce Ayahuasca (in one of the most diverse environments found on earth)? How were other plant medicines discovered in ancient times? How do seemingly unrelated elements, end up becoming related and connected in our minds? Inspiration can arrive to us in many different ways. We can be inspired to produce magnificent works of art and incredible pieces of technology. Or we can be "inspired" to create many forms of destruction. What separates the "good" inspiration from the "bad" inspiration? Why do some people seem to be inspired to produce benevolent things, while others seem to be inspired to produce malevolent things? Does anyone actually set out to produce a malevolent creation? Or does the creation start out as a "good idea" and then get corrupted later on? Why does it seem that some people are able to act as "conduits" or "receivers" of inspiration? Is there only one level to Creation? If the answer to that question is yes, then it follows that all inspiration must flow into us from only that which exists around us in the physical world. Does this sound like a valid explanation for all of the amazing inspirations that people have received throughout history and all of the incredible things that we have created? Not really. If there is more to Creation that what we can see, how many different levels to Creation are there? How many different life forms are there? Are they all like us, or are there some that are completely different than us? Are they good, or are they bad? Perhaps we could use the idea of "as above, so below" to help answer some of these questions. How many different "levels" and "dimensions" are there to life here on earth? How many different personalities of people are there? How much do we really know about what exists in the deepest depths of the ocean? Or what exists under the earth's crust? Or what exists in the air that we breath? How many "dimensions" are there to knowledge and understanding? There is still much that we do not understood about what we can see (not to mention what we cant see). For example, how were the pyramids and other megalithic sites on earth built? Personally, I think that there are many more levels of Creation (and understanding) than what most people are presently aware of. If this is the case, then that means that our inspirations could be arriving from a variety of different sources (with a variety of different motives for inspiring us). How do we know that we aren't "inspiring" other beings in other realms of existence with our thoughts? If there was another layer of Creation that was receiving ideas and inspirations from us, what would they think of those inspirations and the beings that were inspiring them? What do most people think about and occupy their time with in this world? If "inspirations" (received by others) were based on our thoughts and our activities, would we be considered a "good" influence on them or a "bad" influence on them? How do we view the "inspirations" that we receive from outside sources? If we accept for a moment that there are many different levels of reality, which of those realities would be considered the heavens, and which ones would be the hells? Who would be the angels, and who would be the demons? The fact is that every "being" in Creation has the potential to be an "angel" and/or be a "demon". And every world in Creation has the potential to become a "heaven" and/or become a "hell". We all have a light side, and a dark side...a known side, and a shadow side. It's how we choose to live our life, through freewill, that determines our nature and our "state of being". What if a residence had many lights turned on inside on a very dark night? Some of that light would probably bleed out into the external environment through the windows. In other words, the light inside, would help to light the outside. On the other hand, what would happen if there were no lights turned on inside the house? Then the external environment would likely be dark as well. Using another analogy, what if you had a hot air balloon and you cut the ropes holding it in place and then stoked the fire under the balloon? The balloon would begin to rise. The more that you stoked the fire, the brighter that the fire would become, and the more that the balloon would rise. On the other hand, what if you filled the basket with many heavy rocks? The balloon would probably stay grounded, even if the ropes were cut and the fire was stoked. What is the significance of the analogies above? The internal environment is intimately connected to the external environment. Is there any danger associated with putting a thousand lights in your residence or creating a huge bonfire under your balloon? What happens when we let our passions and our "fires of creation" run wild in this world? Someone or something usually ends up getting burned (or destroyed). Is there any problem with keeping the lights off in the house and/or suppressing the fire underneath the balloon? Only that few people (on the outside) would benefit from inside lights that are never turned on, or from an internal spark that is never ignited to produce an outside fire (light and warmth). Acting Together, Or Acting Alone? In the universe, there is light energy and there is dark energy. Light energy prefers the light, and dark energy prefers the dark. When the light and the dark become separated from each other, the light becomes ignorant of the dark, and the dark becomes ignorant of the light. However, when the light and the dark are put together, the light has the opportunity to learn from the dark, and the dark has the opportunity to learn from the light. Together, the light and the dark create choice. Together, the light and the dark create freewill. Together, there is the potential for experience, learning and growth. And together, there is the potential for awareness. There are many different combinations of light and dark that are possible. And each combination provides a different opportunity for experience, learning and growth. However, with choice, also comes the possibility for imbalance. When a vehicle in Creation loses its way and becomes separated or disconnected from Creation, it can become imbalanced. If that imbalance becomes pronounced, the light and the dark can become very "polarized" towards each other and can begin to oppose one another. Sometimes they can become so polarized that they begin to think that they can exist without the existence of the other one. When the conflict between the light and the dark turns into a full-fledged battle, there is a split that can occur. By themselves, each aspect of Creation is partially conscious. These partially conscious fragments have the ability to become animated, but they cannot become aware (when separated). And because they are "unaware", they do not understand that they are actually existing as fragments of the whole. Since these fragments of awareness are composed of only energy, their ability to express themselves in the physical world is somewhat limited. Therefore, they usually try to find suitable hosts that can serve as vehicles for their expression. In this world, the light fragments tend to seek out those who are imbalanced towards the light (i.e. the willfully ignorant and certain aspects of the New Age), and the dark fragments tend to seek out those who are imbalanced towards the dark (i.e. dark occultism and Satanism). In both of these cases, vehicles that were imbalanced to begin with, end up becoming more imbalanced as fragments of partial awareness cling to them and affect (infect) their ability to properly reason, discern and understand. Because these fragments have become blinded to the other polarity (light to dark and dark to light), they can often act in some very bizarre ways (and can cause their hosts to act in similarly bizarre ways). The light wants to create an environment of all light. And the dark wants to create an environment of all dark. In the end, both of these fragments (of potential awareness) usually end up destroying the environment that they live in (before they ever have the chance to become aware and conscious again). Who are the beings of Light? The beings of Light are those beings who have come to know and understand both the light and the dark and have become balanced in such a way that their "being" helps to encourage the addition of more Light in the world (knowledge, awareness, understanding and wisdom). Who are the beings of darkness? The beings of darkness are the ones that can only see the light, or that can only see the dark. They are the ones that can only see the right, or that can only see the left. They are the ones that can only see below, or that can only see above. They are the ones that are unable to see One, because they have become blinded by one. 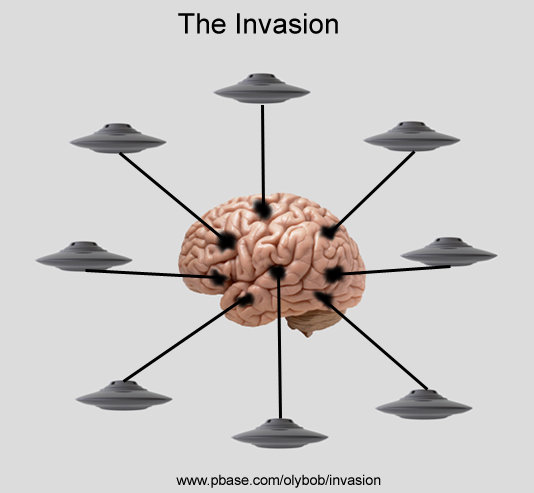 What is the Real Invasion? The true enemy is not the people of the systems, it is the systems of the people. The true enemy of the people is the Machine. Anywhere that ignorance is encouraged and awareness is suppressed, this is where you will find the enemy. And anywhere where there are manufactured systems of conflict and highly polarized systems of control, this is also where you will find the enemy. The people are more of a symptom of the disease, than the disease itself. However, the disease cannot exist, without the help of the people. One of the greatest examples of the "disease" can be found in the Organized Abrahamic Religions (Christianity, Islam and Judaism). Not only is the idea of separation present in these religions (between us and God), but there is also the idea that a conflict exists between God and us. These religions are continually pitted against each other which causes more conflict and more polarization...not just between the people, but also between the people and Creation (God). There is even the idea that a separation exists between us and nature in some of these religions (isn't nature the thing that sustains us and keeps us alive?). How much more "alien" can you get than that? It's interesting to note that these three organized religions (that oppose one another), have a built-in fail-safe mechanism against any kind of opposition to their opposition. If you oppose the opposer and oppose their acts of opposition, then you risk being labeled as the opposer (i.e. the "Adversary"). Could a human being really think up such a system? Why would the Creator create such a system of conflict? Or is this just another example of the fingerprint of the "alien", the "gods" and the mask of the matrix? Where else do we see this type of built-in fail-safe mechanism? How about with the New World Order? The New World Order is supposed to create a one-world government and a one-world religion. And it is through this consolidation of power that the "elite" are supposedly going to rule the entire world. Where is the fail-safe mechanism? Anyone that suggests unity and community in the world (among people and religions) must be promoting the New World Order. And anyone that is opposed to centralized authority and the consolidation of power, must be against unity and community. Sounds ridiculous. And it is. It would be funny, except for the fact that there seems to be so many people that are programmed to react this way. Manufactured division and inversion are key traits of this disease. We can also see the fingerprints of this disease in what might eventually become the North American Union, the European Union and the Asian Union (or in Orwellian 1984 terms Oceana, Eurasia and Eastasia). Just to clarify, this phenomena exists almost exclusively in artificially created systems of conflict and in extreme states of polarity (polarization), not in natural conflict (disagreements) or in unmanipulated natural polarities (nature). To really understand this phenomena, it is necessary to use a mode of thought that extends beyond our commonly accepted ways of thinking (normally "bound" by our established beliefs and our understanding of space, time and physicality). Perhaps it would also be beneficial to create a broader definition (and interpretation) of words such as angel, demon, vampire, alien, possession and exorcism (as they relate to this phenomena). While reading the quotes below, try to think of them in the context of how an entity, energy or "intelligence" (human, non-human or artificial) might behave if it was removed, separated or fragmented from Creation. Also, keep in mind that this phenomena can act very much like an infection. It can cause those that are infected to behave in ways that they normally wouldn't behave. It can also cause those that are infected to modify themselves and their environment in some very significant ways, thus modifying and morphing itself in the process. It can take on many different forms and it can create many different illusions. The pathological aspect of this phenomena, however, is not all-powerful. It relies on illusion and the ignorance of its hosts in order to survive and to grow. Therefore, knowledge, awareness and understanding are key elements in the development of physical, mental and spiritual protection. This is not a typical battle (in the way that some might think), because this is a phenomena that cannot be totally eliminated. Rather, it is more of a journey and a quest to find the proper tools that are necessary to nullify the pathological and pathogenic aspects of this phenomena and render them inert. Be aware that this phenomena will fight back. It will try and make you think that it does not exist. If that doesn't work, it may try to scare you into submission. It will do its best to try and preserve its habitat. It will try to use you to suppress and discredit others who are trying to expose it. It will try to recruit you as an agent for its cause (the "resistance" to awareness). Few people have had the opportunity to witness this phenomena as it exists in its true (underlying) "elemental form". Instead, as previously discussed, we mostly see its "fingerprints" or its symptoms in the systems of our world. Anywhere that you see highly polarized mechanisms of control (i.e. the System of Two) or artificially created conflicts (wars, politics, social classes, etc), this is where you will find the presence of this phenomena. "We have a predator that came from the depths of the cosmos and took over the rule of our lives. Human beings are its prisoners. The predator is our lord and master. It has rendered us docile, helpless. If we want to protest, it suppresses our protest. If we want to act independently, it demands that we don't do so." "In order to keep us obedient and meek and weak, the predators engaged themselves in a stupendous maneuver; stupendous, of course, from the point of view of a fighting strategist. A horrendous maneuver from the point of view of those who suffer it. They gave us their mind! Do you hear me? The predators give us their mind, which becomes our mind. The predators' mind is baroque, contradictory, morose, filled with the fear of being discovered any minute now. " "They took over because we are food for them, and they squeeze us mercilessly because we are their sustenance. Just as we rear chickens in chicken coops, the predators rear us in human coops. Therefore, their food is always available to them. " "I know that even though you have never suffered hunger you have food anxiety, which is none other than the anxiety of the predator who fears that any moment now its maneuver is going to be uncovered and food is going to be denied. Through the mind, which, after all, is their mind, the predators inject into the lives of human beings whatever is convenient for them. And they ensure, in this manner, a degree of security to act as a buffer against their fear." "Sorcerers see infant human beings as strange, luminous balls of energy, covered from the top to the bottom with a glowing coat, something like a plastic cover that is adjusted tightly over their cocoon of energy. That glowing coat of awareness is what the predators consume, and when a human being reaches adulthood, all that is left of that glowing coat of awareness is a narrow fringe that goes from the ground to the top of the toes. That fringe permits mankind to continue living, but only barely." "This predator, which, of course, is an inorganic being, is not altogether invisible to us, as other inorganic beings are, I think as children we do see it and decide it's so horrific that we don't want to think about it. Children, of course, could insist on focusing on the sight, but everybody else around them dissuades them from doing so." "Sorcerers say that discipline makes the glowing coat of awareness unpalatable to the flyer. The result is that the predators become bewildered. An inedible glowing coat of awareness is not part of their cognition, I suppose. After being bewildered, they don't have any recourse other than refraining from continuing their nefarious task." "If the predators don't eat our glowing coat of awareness for a while, it'll keep on glowing. Simplifying this matter to the extreme, I can say that sorcerers, by means of their discipline, push the predators away long enough to allow their glowing coat of awareness to grow beyond the level of the toes. Once it goes beyond the level of the toes, it grows back to its natural size. The sorcerers of ancient Mexico used to say that the glowing coat of awareness is like a tree. If it is not pruned, it grows to its natural size and volume. As awareness reaches levels higher than the toes, tremendous maneuvers of perception become a matter of course." "The flyers are an essential part of the universe and they must be taken as what they really are; awesome, monstrous. They are the means by which the universe tests us." "We are energetic probes created by the universe, and it's because we are possessors of energy that has awareness that we are the means by which the universe becomes aware of itself. The flyers are the implacable challengers. They cannot be taken as anything else. If we succeed in doing that, the universe allows us to continue." "The predator is not something benevolent. It is enormously heavy, gross, indifferent. You can feel its disregard for us. Doubtless, it has crushed us ages ago, making us weak, vulnerable, and docile. You have your unbending intent, not to let them eat you." "Soon you will be entering into infinity by the force or your personal power. Once you have entered into infinity, you can't depend on anyone to bring you back. Your decision is needed then. Only you can decide whether or not to return. I must also warn you that few warrior-travelers survive this type of encounter with infinity. Infinity is enticing beyond belief. A warrior-traveler finds that to return to the world of disorder, compulsion, noise, and pain is a most unappealing affair. You must know that your decision to stay or to return is not a matter of a reasonable choice, but a matter of intending it." John Lash: "In the Gnostic view, the invasion of our world by hostile ETs has been underway for millennia, via the intrusion of an alien mindset into human consciousness, rather than a physical invasion with saucers and Flash Gordon death-rays." I think that the Gnostics had some very important pieces of the puzzle. This is just one excellent insight among many. What happened to the Gnostics? The same thing that happen to many indigenous peoples. John Lash has written many good essays on the Gnostics, the Archons and the Nag Hammadi texts. However, recently he seems to have adopted a philosophy of "termination", rather than one of eradication (inoculation). Personally, I'm in favor the inoculation route (I'll discuss why in the next segment - The Resistance). "...the psychic conditions which breed demons are as actively at work as ever. The demons have not really disappeared but have merely taken on another form: they have become unconscious psychic forces." "Possession, though old-fashioned, has by no means become obsolete; only the name has changed. Formerly they spoke of 'evil spirits', now we call them 'neurosis' or 'unconscious complexes'." "...man himself has taken over their role (demons) without knowing it and does the devilish work of destruction with far more effective tools than the spirits did. In the olden days men were brutal, now they are dehumanized (my emphasis) and possessed to a degree that even the blackest Middle Ages did not know." "...an unknown 'something' has taken possession of a smaller or greater portion of the psyche and asserts its hateful and harmful existence undeterred by all our insight, reason, and energy, thereby proclaiming the power of the unconscious over the conscious mind..."
"...a man does not notice it when he is governed by a demon; he puts all his skill and cunning at the service of his unconscious master, thereby heightening its power a thousand fold." "...the demon that is always with you is the shadow following after you, and it is always where your eyes are not." Paul Levy: A demon or autonomous complex, to quote Jung, "behaves like an animated foreign body in the sphere of consciousness. The complex can usually be suppressed, with an effort of will, but not argued out of existence, and at the first suitable opportunity it reappears in all its original strength. "Due to their lack of association with the conscious ego, autonomous complexes are typically not open to being influenced, educated, nor corrected by 'reality'." Paul Levy: Writing about autonomous complexes, Jung says, "...the complex forms something like a shadow government of the ego," in that the complex dictates to the ego. When we are taken over by and in internal conflict with and because of an autonomous complex, it is as if we, as natural rulers of our own psychic landscape, have been deposed, and are living in an occupied country. We are allowed our seeming freedom as long as it doesn't threaten the sovereignty and dominance of the ruling power. Comment: The quotes above by Carl Jung and Paul Levy are very similar to the Gnostic view of the "Archons". Archons are said to be the "cousins" of humans, but are not quite "complete" in their being. They have intelligence, but they lack the reasoning abilities that humans are capable of. Thus, Archons often act in an "unconscious" and destructive manner without ever coming to realize the true nature of their behavior. Does this not sound very similar to the inflated and blind egos of those who are in currently in power (that are destroying this world)? It's interesting to note that a demon is often described as a "disembodied" spirit. Is this not similar to a shadow? When a person stands in front of a bright light, what is it that extends out in front of them on the ground? Their "disembodied" shadow. The ego, when diseased or corrupted, is very much like a disembodied shadow aspect of us. Disembodied egos behave much like "black oil" does on water. In other words, the oil stays separate from the water, but it will "congregate" together with other oil and form a large dark "collective" mess on the water's surface. The only difference is that the diseased ego is much better at hiding itself than the oil is (that is unless Corexit is sprayed on the oil...then the diseased ego and the oil are very much the same...just as dark, just as hidden and just as toxic). John Mack (UFO and abduction researcher): "A number of shamans with whom I have spoken, from native cultures of North and South America, Africa, and Australia, know of, or have had encounters with, beings that have properties much like the grey aliens that visit abductees in the United States and other Western societies." Karla Turner (UFO and abduction researcher): "Aliens can take us - our consciousness - out of our physical bodies, disable our control of our bodies, install one of their own entities, and use our bodies as vehicles for their own activities before returning our consciousness to our bodies." From Wikipedia: "In Ancient Near Eastern religions as well as in the Abrahamic traditions, including ancient and medieval Christian demonology, a demon is considered an unclean spirit, which may cause demonic possession, calling for an exorcism." Comment: When a new light (knowledge/awareness) begins to permeate into an old paradigm of established darkness or diseased dogma (in an individual or society), the diseased ego (of the individual and the collective) will fight back and try to maintain its hold on us. The resulting battle that ensues can be quite unsettling to witness and experience. Interestingly, the symptoms that are often seen expressed in the individual and in society during these times, are quite similar to those that are often seen expressed in some "possessed" individuals that are receiving an "exorcism". In this way, our current predicament in the world could be seen as one that is worsening (based on the symptoms that we are seeing and feeling). However, just as with a cold or the flu, the sickness often appears to be at its worse just before it begins to get better. As with any virulent infection, the recovery period can be short or it can be very long and drawn out. It just depends on the general health of the body and how many immune cells are available and immobilized to fight the infection. There are some diseases which can actually "trick" the body into fighting itself (autoimmune disease). In those cases, the recovery period can be quite long, often continuing until the body finally realizes that it has actually been fighting part of itself. From Wikipedia: "Vampires are mythological or folkloric beings who subsist by feeding on the life essence (generally in the form of blood) of living creatures...vampiric entities have been recorded in many cultures, and may go back to prehistoric times". Its interesting that the concept of "vampires" (under different names) is so widely dispersed among different cultures around the world and during different times in our history. What happens when you approach a person, a group, an institution or a society with some knowledge (i.e. awareness) that interferes with their manufactured zone of comfort and/or challenges their dogmatic systems of belief? often resists being "exorcised" and brought out into the "light"
In each moment of each life, we have the opportunity to help bring awareness into our minds and into the world that we live in. What happens if we choose to ignore that opportunity? We get to repeat the same process all over again in another world (that we have chosen to align ourselves with). Those that choose to live their lives in a "state of darkness", will live in a world filled with darkness and ignorance. Those that choose to live their lives in a "state of Light", will live in a world that is filled with awareness and Light. This is referred to as consequence (i.e. karma; causality; you reap what you sow; the fruits of your actions, so shall you bear, etc). The deeper that we live in the dark, the more fragmented that we become. The further away from Creation that we live (spiritually), the harder that it is to see the Light (awareness) of Creation. However, the greater that our "will" and our Conviction of the Heart is, the quicker that we can find our way back to that which we have become separated from. One final thought, there is much good esoteric information to be found in religions. However, those that teach and preach only an exoteric "awareness" of the "book", rather than an awareness of Creation (the world around you and the world within you), may in fact be preaching the ignorance of religion, rather than teaching the awareness of Creation.